Boomshake presents a new take on our annual production ... Comic Book Style! In a world where evil forces conspire to displace us, erase us, deport us, and lock us up, it is the youngest ones who are about to become heroes. They’re digging deep to find their superpowers so they can save this city. They’re joining forces with Oakland activists and superheroes from out of this world. BOOM! POW! BOOMSHAKE BOOMSHAKE! On December 8 & 9th 2018, you can combine forces with the children, workers, drummers and superheroes to superpower the movement and strike down the evil forces of gentrification, police & state violence and economic oppression. Activist powers… ACTIVATE! Form of… a people’s movement! Shape of… an intergenerational drumsical! Directed by youth artist Terri McFadden, 'The Marvelous Adventures of Cape and Fist’ will show that not all heroes wear capes and masks, it’s what inside us that makes us all the superheroes we are. This revolutionary drumsical will feature our multigeneraltional participants who are youth, womxn, trans, and gender non conforming people of color and everyday heroes. Adapted from the children’s book by Kurusa about a true story of Venezuelan children fighting for a safe place to play outside in their barrio, this show is set in an Oakland that transforms into the pages of a comic book. As we deal with the villains working to kick us out of our city, the children organize and unite us in the fight for an Oakland for the people. 'The Marvelous Adventures of Cape and Fist: When the Superheroes Free the Oakland Streets' features participants from BoomShake’s community programs including Abundant Beginnings Forest Freedom School, Manzanita SEED & Manzanita Community Elementary, Womxn’s Street Drumming, BoomShake’s Performance Core, and artistic collaborations with Pedro Rosales, Kyla Danysh, Ava Square-Levias, and Shari Daktari. This project is supported in part by the California Arts Council, City of Oakland's Cultural Funding Program, the Zellerbach Family Foundation and our Community/Family & Friends. In a time when art and music in Oakland are under siege with rising attacks against the freedom of people of color to gather or play music in public spaces, we need you to take a stand for opportunities to gather, share our culture and express ourselves creatively. Help us reach our goal of raising $3500 so that we can continue to be the heartbeat of the resistance. -Our participants and volunteers are nourished with good food as they come together to put their hearts and souls into telling our stories and sharing the work they’ve done all semester long. 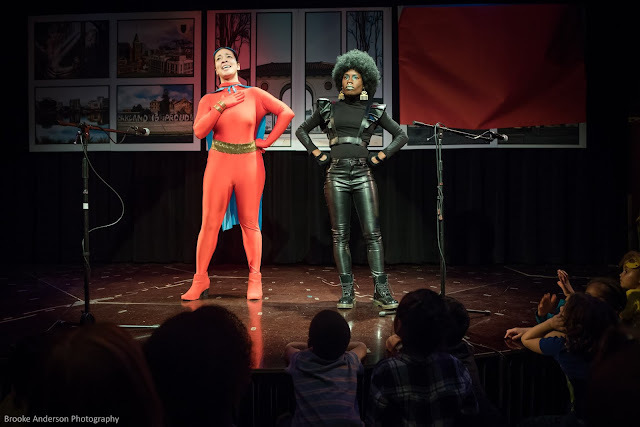 Themes: ‘The Marvelous Adventures of Cape and Fist: When the Superheroes Free the Oakland Streets’ is a drawing up of our youth led realization of community based justice, through the lens of the beautiful struggle of people of color, womxn, trans and gender nonconforming people. With drumming and storytelling we create space for joy and provide support to movements for our freedom.